Tourism Malaysia today expresses its supports towards ShopBack Malaysia’s Chief Travel Officer (CTO) campaign, an attractive idea that offers RM15,000 for a travel lover to go for three trips within Malaysia and showcase how he/she does it through a smarter way via videos. 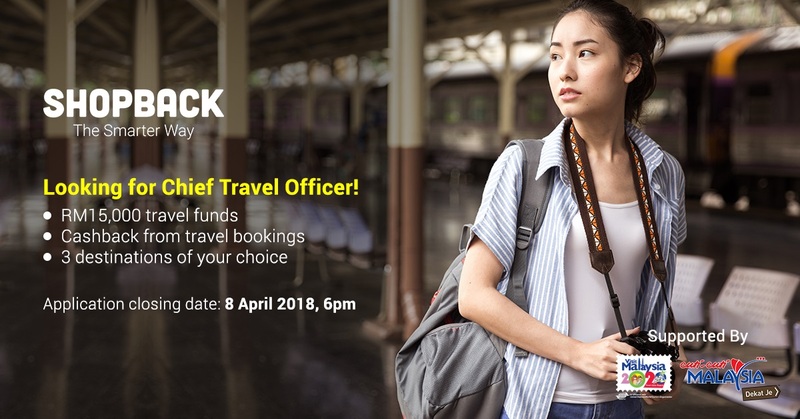 “Travel has become a common hobby among the youth, and we believe ShopBack’s Chief Travel Officer campaign will certainly drive interest and conversations towards the interesting places in Malaysia. The first CTO campaign in 2017 was a success, and we are glad that ShopBack Malaysia is passionate to keep this going – more worthy places could be discovered by the next Chief Travel Officer,” says Mr. Mohd Amirul Rizal Abd Rahim, Deputy Director, Domestic & Events Division, Tourism Malaysia. “Malaysia is a blessed country with beautiful destinations. Many of us are travel lovers too, therefore we initiated a social campaign that embodies money-saving skills, passionate travel spirit as well as fun and daring adventure. The first CTO brought us to places less publicised such as Kudat, the tip of Borneo in Sabah while nicely demonstrated how she saved on trips booking via ShopBack through lively videos. We look forward to working with the next Chief Travel Officer for a more engaging experience like this,” says Alvin Gill, Country General Manager, ShopBack Malaysia. The leading cashback site works with a full range of travel sites that covers airlines, bus, rides, accommodations and tour services to offer cashback on top of discounts provided by merchants. Those include Malaysia Airlines, easybook, Expedia, Booking.com, Traveloka, Hotels.com, Adventoro, KLOOK, Grab and more. The Chief Travel Officer will be given a RM15,000 travel fund to plan for 3 holidays within Malaysia. He/She will need to demonstrate how the travel planning was done, film and share travel experience with the public. The campaign targets to encourage youth to travel the smarter way and appreciate the beauty of the country that they live in. Amirul also expressed that the Chief Travel Officer campaign will help to amplify Tourism Malaysia’s Cuti-Cuti Malaysia Dekat Je Domestic Campaign and Visit Malaysia 2020 campaign, where ShopBack’s CTO will indirectly promote local tourist attractions and generate interest on domestic travels among Malaysians. “We appreciate Tourism Malaysia’s endorsement of this campaign and are confident that it will resonate well with travel communities and show them a journey to enjoy travel without burning a hole in the pocket. Since 2015, we have helped Malaysians to save more than RM25 million Cashback from their purchases, of which a chunk of it is from travel expenses,” Alvin added.